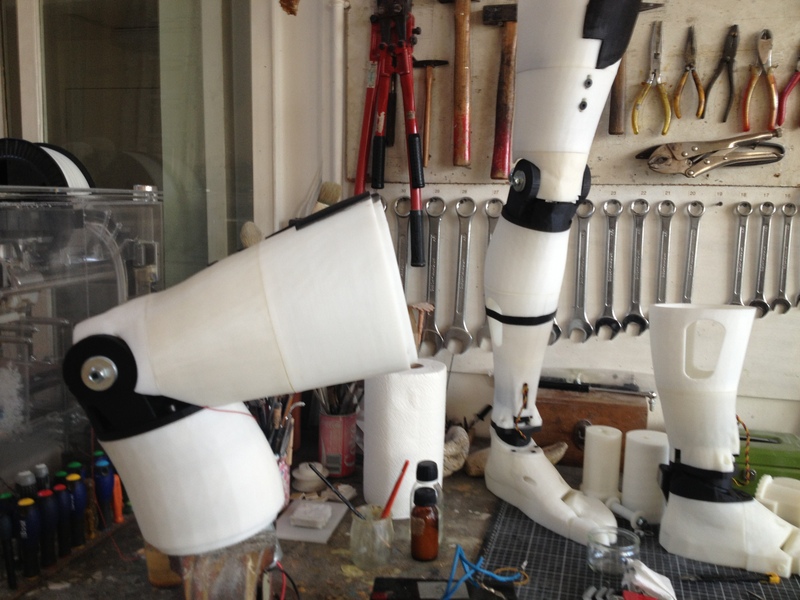 In this tutorial I will show you how to assemble the leg parts for non motorized version. It is pretty easy if your prints are correctly printed without warping otherwise, you will have a hard time to join all the parts together. Beware that some of these parts are really big and exceed the standard 12x12x12 cm. The non motorized legs are mainly for show. They allow to have the robot standing up on it’s own legs. 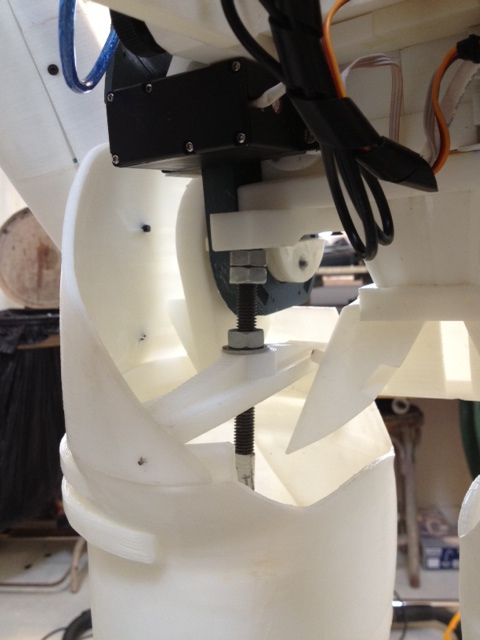 The robot will be bolted and fixed to a large 60x60cm plate for to assure it’s stability. A 10mm rod will run from bottom plate to the top of the legs. 1. i print all pieces in ABS without problema but i think here are many pieces very big, how solve the warpping problem? or direc print in PLA? The only way to avoid warping when printingbig parts in ABS is to have a closed printer which keeps a permanent inside temperature and avoids any outside draft. Also printing on glass is up till now the best solution I have been using which keeps the part safely attached to the heated bed. the KneeBolts and KneeBoltsSmall, are the same STL, is this correct? Look’s like you are right. The link is going to the same files. Thanks for publishing the legs, Gael. There might be a tiny typo in the pice list of the guide. I don’t think the leftAnkleBase really needs support. Fixed the pieces list on the tutorial page. more people have issues that the “KneeHighLeftV3” and “ThighLowLeftV1” dont fit? 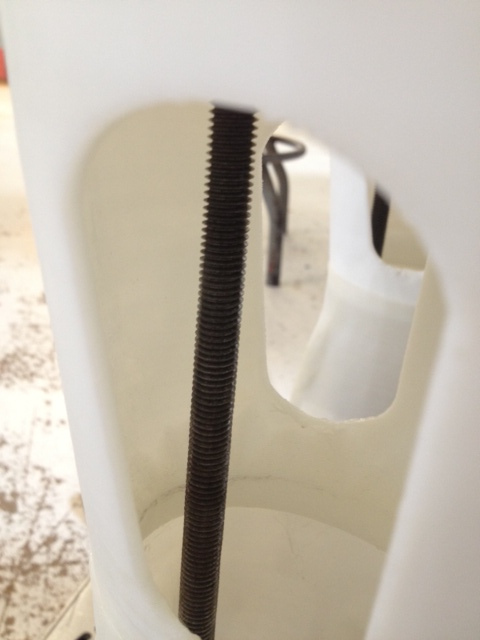 when i line up the outside of the part, the holes (for bolts) dont fit. they seem to be off by 4mm. no problems with the rest. Robbert could you make the holes a bit bigger on one of the parts, place a washer and retighten ? Or glue it in place, drill the holes to line up and use a slightly bigger bolt? Nice to see you around!! I fixed the part to download, but indeed, Robert can make the hole bigger and use a washer to tight it in place. You do not need to reprint, just drill to fit. Il faut une tige filetée de 10mm, longueur 1000mm(1metre) par jambe. These legs are temporary and I tried to make something for the users with various pieces of my 3 differents leg design R&D for motorization, that is why there is some parts that do not match with the other. I have already made the part to use the center hole for KneeHighRightV3 and KneeHighLeftV3, you can check the update. Just a couple of pieces left for me to print 🙂 Where does ‘ThighSideAccess[Left/Right]V1’ go? I can’t see from the images where it fits. It’s placed, glued or screwed to the ThighHighTempV1. I have added pictures in the tutorial to let you see. La tige fileté traverse la cheville et le pied pour aller se loger et traverser(ou pas) footBoltHolder. FootboltHolder peut-être utiliser dans deux sens différent, il peut être vissé à la planche(plateau) qui sera sous les pieds du robots, ou bien comme si c’est un servo moteur dans le logement de AnkBackFoot. it would be fine if everyone would us the english language. Not everyone can speak french, so english should be the common language on international websites. There is a frankophone forum for the french people who don’t speak or want to speak english. Hi Gael, thank you so much for great work! If I’m not mistaken, LeftAnkleDownV2 and AnkleDownV2 are exactly the same? Yes they are similar parts. thank you Gael for the james, we can never say enough. How to hold the ankle in place without sticking AnkleBase to AnkleDown? Hello, the 10mm rod that goes from the top to the bottom is holding all leg parts tight to each other. Like a big sandwich sort to speak. 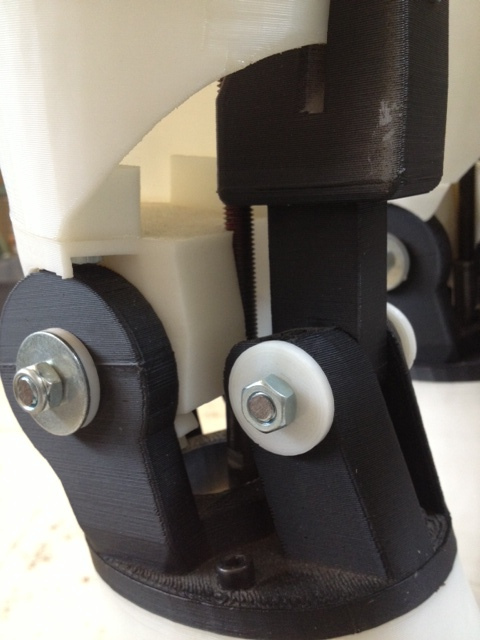 Do you have the servo linkages for the Ankles as a STL available? The parts that would drive the “AnkleDownV2” gearing ? Great work! These parts are too weak to be efficient, therefore I din’t upload them. If I would upload them, I am sure some people would request detailed tutorial and more. 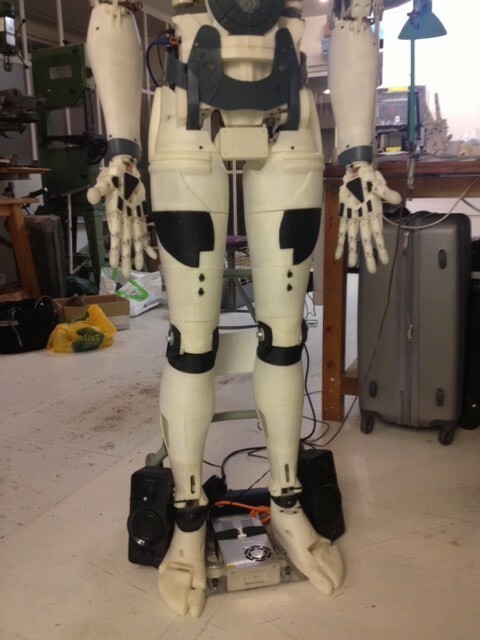 I am actively working on a set of legs with motors, which will be much more efficient than my early prototypes. I tried Google translate but in French it’s some kind of a “sitting fish”. Maybe a better location explanation will do the job. Sorry The cod cover would be a crotch cover or a groin cover front middle of legs ? This is great! Do you have any recommendations for 3D printers I can use for this? Like what are the minimum printing dimensions my printer should have for this? I read the 12x12x12 cm won’t suffice, but what will? Would greatly appreciate it if you could help me out. Thank you. Anywhere or Anyone with a list of nuts and bolts? I need to buy them and its difficult to guesstimate…. holes with M6 or M8 as well and different lengths. hand and my M8 seems to short. Will be there any motorized version of those legs? Will inmoov walk in near future? 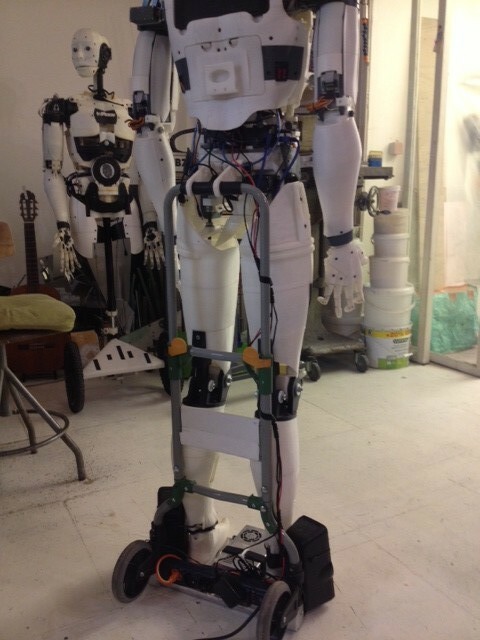 You installed a char (“diable” in french) behind inmoov to maintain him vertically, I also saw a fixation on this char, is it possible to obtain the stl of this support? Which seems to be fixed to the mid stomach of the robot. I have uploaded the parts in the Gallery/stl/other useful parts. 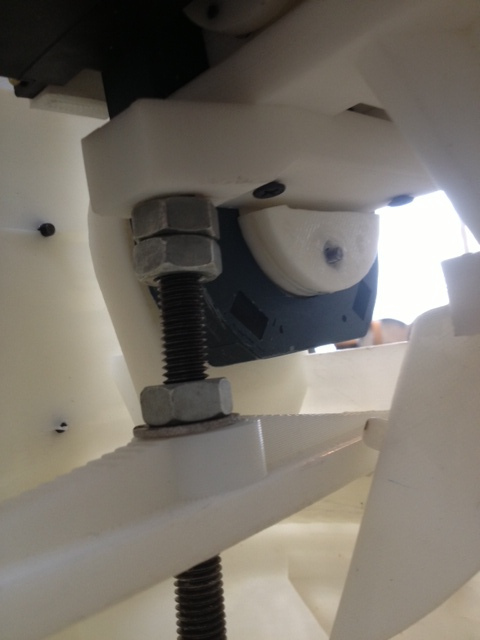 The foot bolt holder, does this go inside the foot or on the bottom as shown in the drawings? 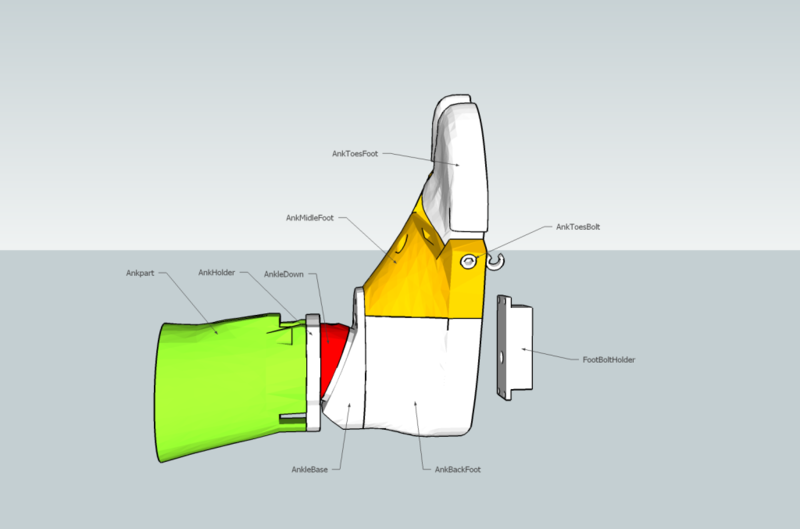 If you plan to attach the foot to a mobile plateforme, it goes as shown on the drawing. If you want the legs to be independant, it goes inside the foot. Very good job. I think that legs were waited by many makers ! Yes motorized version is on its way but I cannot estimate when I will be ready with them. You can find some info about them on my blog and on the forum. My name is Cameron and I am a current student at the Australian Science and Mathematics School. 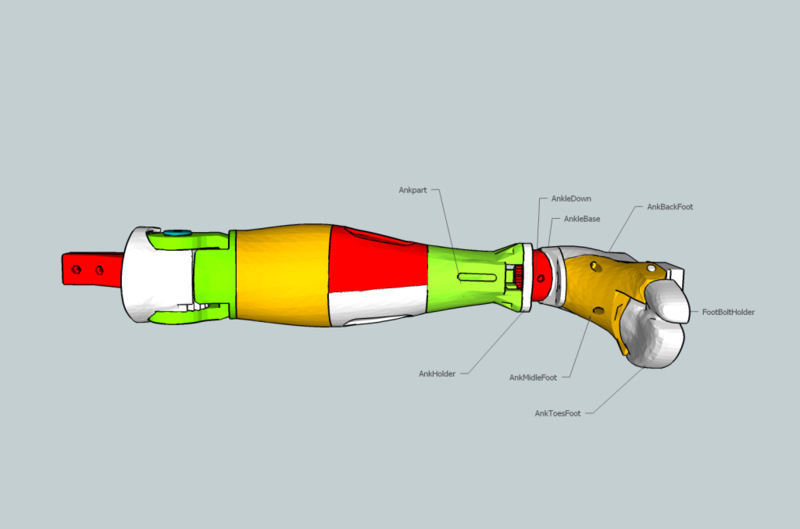 I am currently conducting a research project around what the difficulties are when creating my own Inmoov robotic hand. I am currently in the process of creating all the parts of the hand and would like to ask you a few questions. If you could please pass on an email contact that would be greatly appreciated. Please use the forum for your questions, I cannot manage personal emails, too many requests. My name is Will and I am from Akron Ohio. I have a quick question? I was wondering if you were eventually going to make the legs be printable on a 12x12x12 standard bed? The reason is that my printer is that size and it wont be able to print the pieces otherwise. Thank you for taking the time to read this and I look forward to your response. For now it is not on my TODO list. But the parts for the motorized legs will be 12x12x12cm. The problem is, I do not know when I will be finished with the motorized legs because it is a lot of work. I assembled the non-motorized legs this weekend, but I could not identify the function of the parts ThighSideAccessXXXXV1? I know where they are supposed to go, but is it only decoration on ThighHighTempXX or are they supposed to strongen the leg structure? Did you use _very_ long screws to reach into the TStoLowXXX parts? For the TStoLowXXX parts, I personaly only glued them with acetone. The “long” screws are meant for those builders who want to be sure the parts won’t seperate. But how to attach legs to the body, i’ve checked your photos but i couldn’t find the “solution”.